After the buffoonery and general disastrous shenanigans of yesterday, I needed a lift today. And that’s exactly what I got. A few days in, and I feel this place is starting to give up a few of its secrets. One thing, as with any destination, is hitting the right spot when the tide is right. 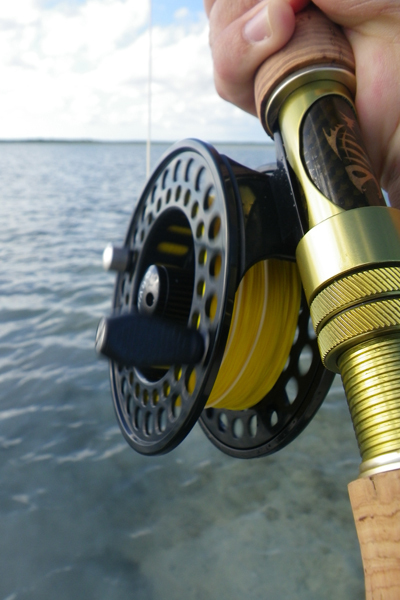 So many places I’ve fished before, it’s been all about looking for that rising tide – not here. Over the last few days, the pattern has become clear. 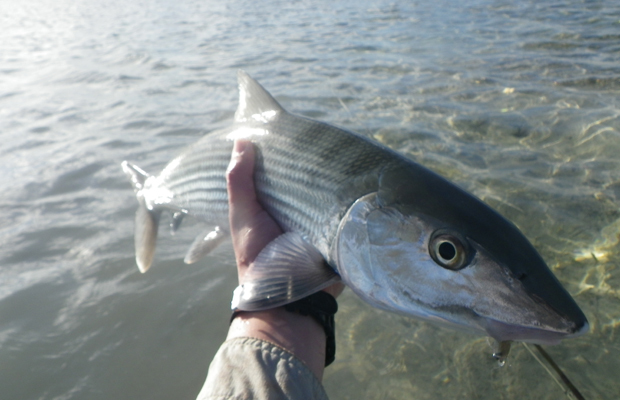 With the rising tide, the bonefish make their way into the network of flooded mangroves behind the Bight, disappearing into the millions of nooks and crannies in search of food. But when the tide falls they’re forced out, more often than not selecting a few choice paths through which to make their exit. Determining where these exit points are and making sure I’m sure there when the moment arrives has been my key learning this week. Of course, you never truly crack the code. 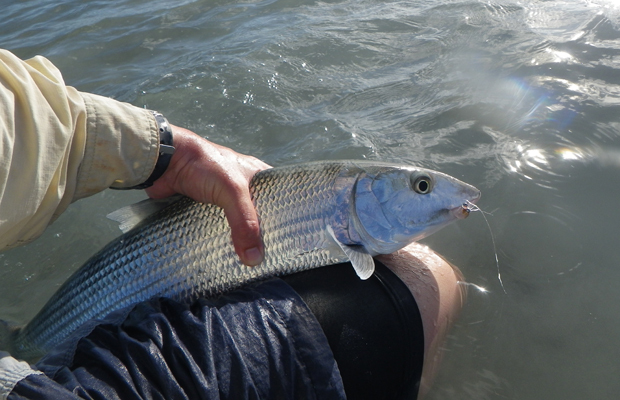 Previously, most of the fish seemed to appearing through a channel in the eastern fringe, where the mangroves give way to the bright white sands of the Bight. Against this sparkling background, the fish are easy to spot – at times I’ve seen wave after wave appear as if from nowhere, clustered together in groups of 20 or so, queuing up in the distance like planes coming in to land. Today, however, it’s a different story. After quite some considerable time waiting, I have one fish to show for my efforts. There’s a trickle where I was expecting a flood. I’m caught in the age-old quandary – wait it out hoping the action is moments away, or move on? Time to roll the dice. Hopping over the sandbar into the ‘boneyard’, with the sun dipping in the west, I’m hoping I might come across some tailers. I see a lot more than that. First up, there’s a boil of water 20m across, about 50m south of me. As I begin wading towards it, another boil erupts to my left, then another to my right, as thousands of bonefish push across the flat. It’s almost impossible to describe an event like this. The fish seem to be in such a heightened state of excitement that the collision of two different schools has the effect of an explosive charge being dropped in the middle, as fish scatter in different directions. The water around me appears to actually be fizzing. At one point I start to wonder whether (and bear with me here) there are too many fish. They’re so preoccupied, pinballing in so many directions that they often find it hard to see the fly in the disturbance. Enough of them do, though, including one seven-pound bruiser that disturbed a different school with every run it made. The best policy was to engage smaller groups of happy, tailing fish which would charge down the fly with careless abandon in the fading light. I felt so completely sated at one point that I decided to sit down on an exposed sand bar and take two minutes just to sit and reflect. I realised I was smiling. All alone, in the middle of an Andros wilderness, I was sat grinning from ear to ear. So I set up the camera on its tripod and hit the self-timer to see if I could do the moment justice. To anyone else, it’s a fairly ordinary shot. But I’ll always know how I felt at that moment, my last full day in a fishing paradise. 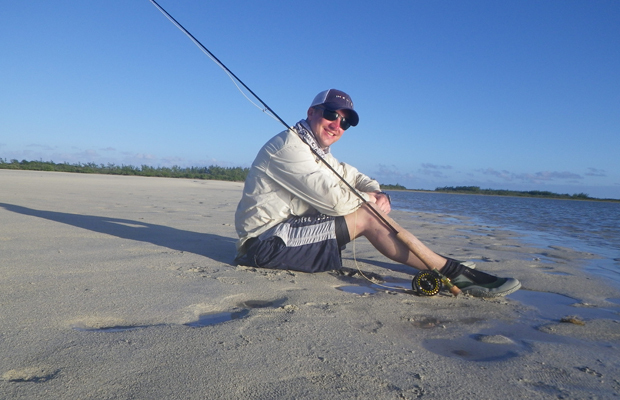 A little later, having just released yet another pristine Bahamian bone, I’d pretty much called time and was beginning to think about a my first cold Kalik of the evening. Edging back through the shallows, six burnished tails splintered the glassy surface film. They were just on the edge of my casting range and I was tempted to just walk on rather finish the day on a failed attempt. But I couldn’t resist. And as the No4 gotcha arced through the evening sun and settled on the sand, a tail broke off from the school and reappeared 10 feet behind my fly line.